How to download and install Bloodline Champions? Bloodline Champions is a free-to-play MOBA. You can download the game from the official website using the download link above. You will need Steam in order to run the game, so make sure you have downloaded and installed Steam and have created an account. The steam page for Bloodline Champions can be found on the second download button above. Once you download Steam, Bloodline Champions should begin installing , you will be able to play Bloodline Champions once the installation finishes. Bloodline Champions is a free-to-play (FTP) 3D Multiplayer Online Battle Arena (MOBA) video game developed by Stunlock Studios and published by Funcom for the Microsoft Windows platform, and was initially released on this platform on January 13, 2011. In Bloodline Champions, players choose from one of the 26 available champions called “Bloodlines”, characters with special powers unique to each of them. All Bloodlines are grouped into four categories or class: melee attack, range attack, healer, and tank. Each Bloodlines in the category have similar base attributes. For example, Bloodlines in the ‘melee attack’ class have attack that work in close-combat only while Bloodlines in ‘healer’ category have less attack powers and more of the ability to heal teammates as well as repair turrets. Every Bloodline has 7 abilities, with each of them having two that can be enhanced to give more effects based on the ability type. Each Bloodline also has a single special ability called the “Ultimate” ability, which can only be used after a certain amount of energy has been gained, which is done by healing allies, helping your team members, and so on. Bloodline Champion makes sure that each gamer can play in their own styles and that victory is achieved by effort, skill and experience and not by luck, purchased items, or random events. Arena mode, which is the most basic and the most popular mode. In this mode, players form a team of 2, 3 or 5 players and are matched against the same number using a clever matchmaking system that fairly pits players against opponents of similar levels. The goal of the game is to kill the enemy Bloodlines a set number of times, and the team to achieve this first wins the game. Upon winning the game, the victor team achieves a large amount of Bloodcoins that can be spent to buy upgrades to your Bloodline’s weapons and abilities. Bloodcoins can also be spent to buy Bloodlines that are not available on the daily rotation (4 Bloodlines are available for use on a single day; this cycle keeps changing), as well as to buy titles and avatars for your profile, and other visual perks. The second game mode is called “Capture the Artifact”, and is the Bloodline Championns version of ‘Capture the Flag’. 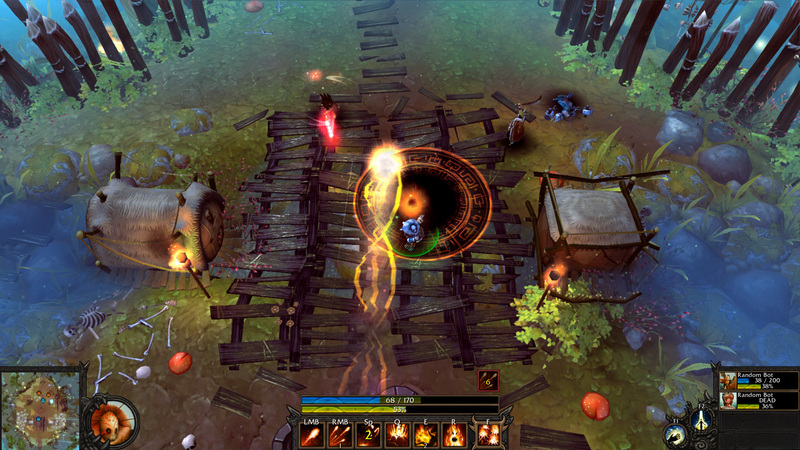 Players form a team and receive an artifact at the beginning of the match which remains at their base. The goal of the game is to steal the opponent’s artifact and bring it to your own base, being successful at which will win the team the round. The Artifact however, requires a certain time before it can be picked up from the enemy team’s base, and this provides an opportunity for the enemy team to interrupt the process. The third and final gameplay mode is called Conquest, a mode in which players must conquer ‘Capture points’ laid throughout the match. If a team has captured all of these points, the enemy team loses their ability to respawn and they lose if they all die without capturing at least one of the points from the other team. The team that captures all the points and kills all the enemy Bloodlines wins the game. A spiritual successor to the game, with heavily influenced gameplay mechanics, called Bloodrite was released on September 20, 2016 and is still available in Early Access stage.